The Chronic Diseases Clinic of Ifakara (CDCI), was started in 2005 as a joint initiative of Ifakara Health Institute, St. Francis Referral Hospital (CDCI), the Kilombero and Ulanga Antiretroviral Cohort (KIULARCO) and the Swiss Tropical and Public Health Institute. The clinic was the first rural HIV treatment center in Tanzania – and is integrated in the St. Francis Referral Hospital (SFRH) in Ifakara. From the very beginning the aim was to deliver healthcare for people living with HIV/AIDS (PLWHA) according the National AIDS Control Programme – but also to better understand the needs of this rural patient population and improve healthcare. 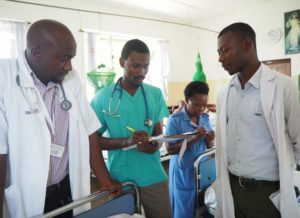 In a joint collaboration between Tanzania (Ifakara Health Institute, IHI) and Switzerland (Swiss Tropical and Public Health Institute, SwissTPH), this linkage of provision of healthcare services, research and training has todate proven extremely effective for the advancement of health services. The establishment of a One Stop Clinic within the CDCI in 2013, enabled us to integrate various additional key services for HIV-affected families. We have since reduced the mother-to-child-transmission of HIV to below 2%. In an ongoing cohort study (Kilombero and Ulanga Antiretroviral Cohort (KIULARCO), close to 9000 patients have consented to contribute their clinical data to address questions on treatment outcome, important opportunistic infections and co-morbidities. This has resulted in considerable improvements in services, with multiple lessons now benefiting the national and international efforts against HIV and co-morbidities. 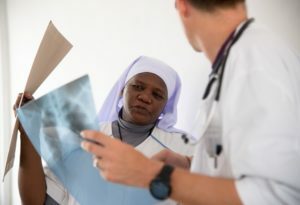 Currently, about 3500 patients are under regular follow-up on an outpatient basis and about 90% of these are taking an antiretroviral treatment. Through our partnership with St. Francis Referral Hospital, we enroll 30 to 80 new cases into care monthly. Unfortunately, about 40% of patients still present only at an advanced stage of disease (WHO class III and IV), leading to a persistent high mortality of 10%. The recently issued decision by the Government of Tanzania to implement universal treatment for all HIV-positive patients necessitates continued commitment in the rollout of the ‘test and treat’ strategy with the aim to curb the HIV epidemics. We are supported by a high-quality laboratory, where viral load and drug resistance testing are done, allowing us to address the important questions of resistance development as well as to individualize patient treatment. Furthermore, improvements for early diagnosis of opportunistic infections such as Tuberculosis and cryptococcal meningitis have been implemented with great success at the clinic.